The Alerts and Notification tab serves to set the threshold meaning the failure of the Data Service endpoint and way to notify you about it. You can set when the endpoint is marked as failing or disable this notification completely. The Never mark endpoint as failing disables the failure notification in the Server UI. If you set this option and the request to the endpoint fails, there will be no red circle notification. 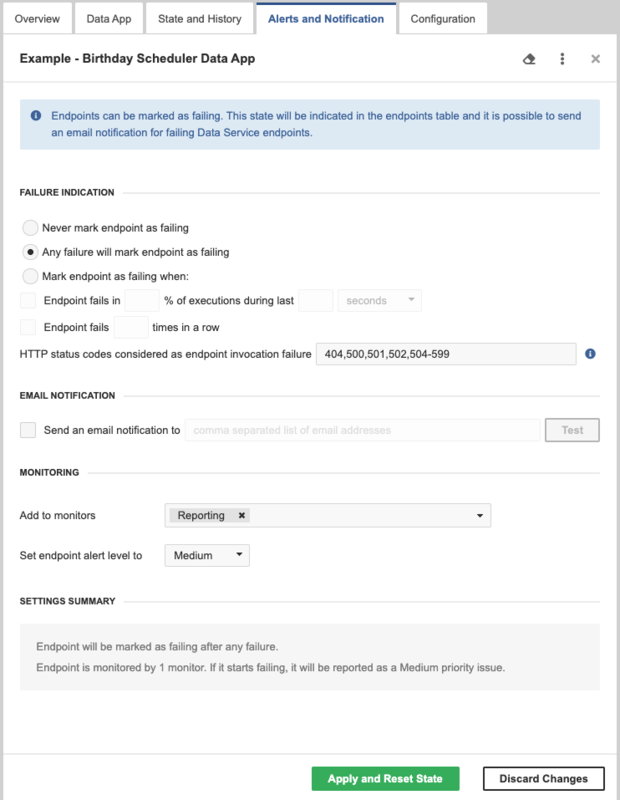 Only the number of failures in activity column in the list of Data Service endpoints will be increased. In this context, any response state from 4xx and 5xx range is considered as a failure. The Any failure will mark endpoint as failing option considers the endpoint as failing even if a single failure occurs. This choice is suitable for infrequently called Data Service endpoints. The Mark endpoint as failing when option sets the endpoint as failing when a threshold is reached. The threshold can be specified as a percentage of jobs is failing or as a number of jobs in row is failing. This choice is suitable for frequently called Data Service endpoints. You can also select HTTP status codes which should be considered by CloverDX Server as an endpoint invocation failure. Select the HTTP status codes by entering individual codes or ranges of codes separated by commas. By default, codes 404,500,501,502,504-599 are considered as an endpoint invocation failure. Leaving the field blank means that CloverDX Server considers all HTTP status codes from the range 400-599 as invocation failure. By default, CloverDX Server does not consider HTTP status code 503 as a failure, because the code is returned in the case of invocation of a manually disabled endpoint. If the Data Service endpoint fails, it is shown in the list of Data Services. Additionally, the number of failing Data Service endpoints is shown in the main menu. You can also set an email notification. This email notification works additionally to the notification in the Server UI. It sends an email when the endpoint's state changes to failing. An email is also sent if the endpoint was failing and you manually reset the endpoint state. With the Test button, you can send a testing email to the addresses of the recipients. 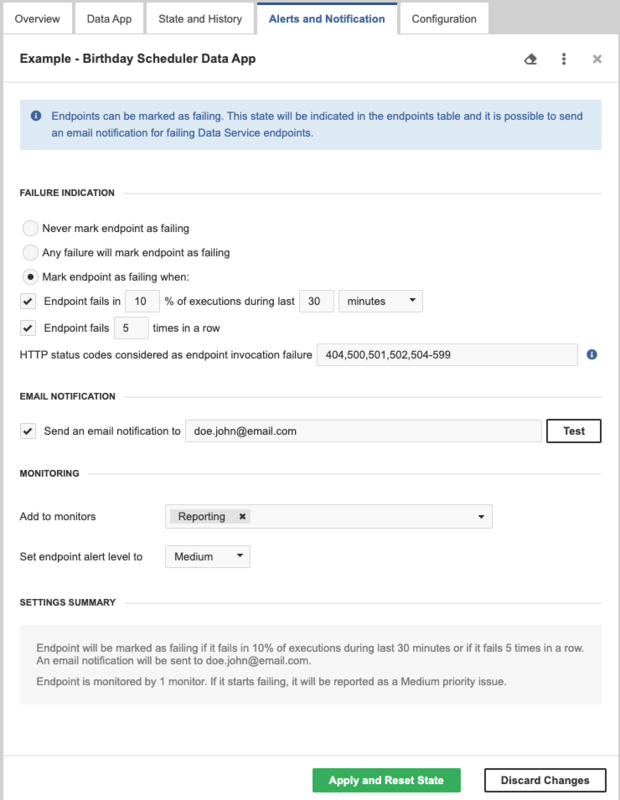 Email notifications requires a working connection to an SMTP server.